Discover how the Striving Styles Personality System gives you a step-by-step roadmap for achieving your potential. Learn how this powerful framework can be applied to your relationships, career, parenting, learning as well as with clients and in organizations. Did you miss our Introduction to SSPS webinar? - We have a recorded version of our webinar. 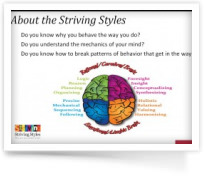 In this video we will introduce you to the Striving Styles Personality System. Heather Hilliard: one of the creators of the Striving Styles, is the facilitator during the webinar and will give you a perspective on how the SSPS differs from other personality and human development programs. The Striving Styles Personality System can help you and your clients achieve lasting results and achieve their potential. Watch our Intro video; it's just the beginning. Brain & Behaviour: why do we behave the way we do? Our introductory video will introduce you to the Striving Styles Personality System. It will give you a perspective on how the SSPS differs from other personality and human development programs. The Striving Styles Personality System can help you and your clients achieve lasting results and achieve their potential. Watch our Intro video; it's just the beginning.